If you are in business, you have to do marketing to be successful. What if you don't have, or want to spend, the money? No problem. Marketers can do good marketing without spending much money. It all starts with understanding and executing the fundamentals. While many in marketing learn the 4P's, that is not enough since it does not include three essential marketing ingredients - the marketing information system, corporate image, and positioning. Hence, I developed the 7 Building Blocks™ model, which includes the following. Marketing Information System strategies to research the market and to continuously collect, analyze, report, and act upon information from the marketplace. Corporate Image strategies to create, protect, and enhance the image of the organization. Positioning strategies that identify the target audience with an unfilled need and fill that need better than competitors with a unique and compelling image of the product. Product strategies that provide the goods and services that the target audience wants. Pricing strategies that offer the product at prices buyers are willing to pay and for which sellers are willing to sell. 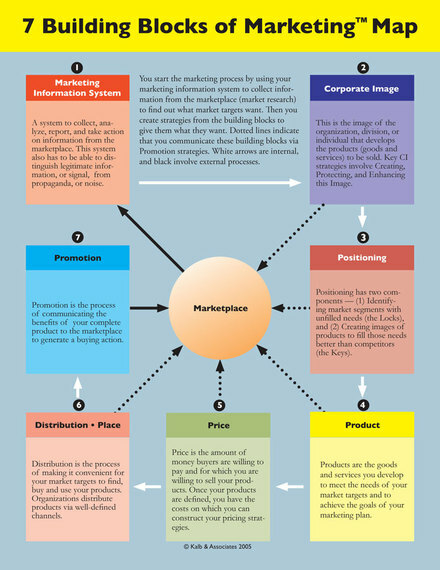 Distribution strategies that make it convenient for the target audience to find, buy and use the product. Promotion strategies that communicate the benefits of the product in such a compelling way to prompt a buying action. Once you make sure you are executing the fundamentals properly, you need a communications structure that will guide you in creating more effective marketing content. Headline. Data shows that 83.3%, on average, only read and remember the headline of a communication. Therefore, it should contain (1) unique and important benefits, (2) a hook to interest the reader to take further action, (3) the name of the company and product (unless the positioning strategy requires separation). Body text. The Body Text should provide more information and details for those that are interested to find out more about the product and company. Since only 16.7% get to this point, marketers should not rely on people reading the body text. Close. 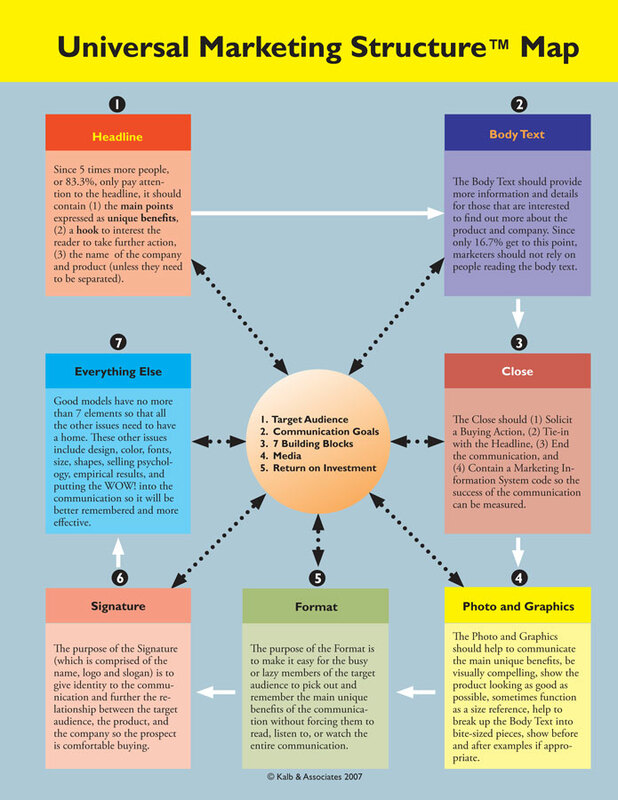 The Close should (1) Solicit a Buying Action, (2) Tie-in with the Headline, (3) End the communication, and (4) Contain a Marketing Information System code so the success of the communication can be measured. Photo and Graphic elements. The photo and graphic elements should help to communicate the main unique benefits, be visually compelling, show the product looking as good as possible, function as a size reference if necessary, help to break up the body text into "bite-sized" pieces, show before and after examples if appropriate. Format. The Format should make it easy for the busy or lazy members of the target audience to find and remember the main unique benefits of the communication without forcing them to read, listen to, or watch the entire communication. Signature. The Signature (which is comprised of the name, logo and slogan) should give identity to the communication and further the relationship between the target audience, the product, and the company so the prospect is comfortable buying. Everything else. 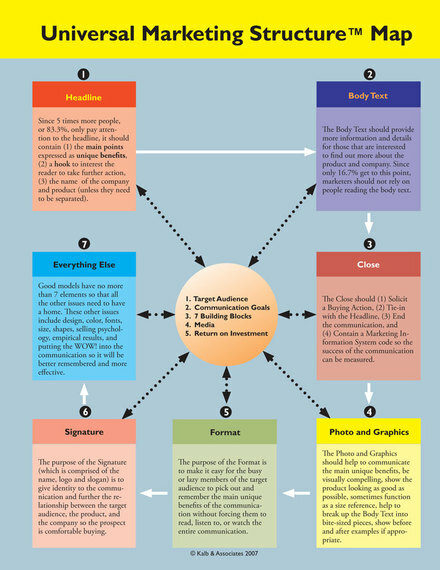 Since people typically can remember up to 7 elements, all other important issues such as design, color, fonts, size, shapes, selling psychology, and putting "the WOW" into the communication should be considered here. So maybe you are thinking that the above falls in the category of easier said than done, and you need more than concept and structure to actually implement strategies that don't cost much. If you are thinking that, you have a point, but learning and understanding the above is still your best shot at doing the marketing you need without spending. Whether or not you want to bother to learn or understand the above, I now will delve into some more specific marketing strategy implementations you can do on little or no budget. Whether marketers realize it or not, email is still the reigning "killer app" of the Internet. If executed properly, it can bring in a lot of revenue without the need to spend money. In addition to using the marketing fundamentals and the Universal Marketing Structure to create better content, you can increase open rates by including the following in the subject line (1) a unique benefit-focused headline, (2) names (personalizing), (3) urgent or important, (4) announcement or invitation, (5) free shipping, (6) thanking the recipient. The following is likely to decrease open rates: (1) last chance or missing out, (2) donation or charity (although the word "helping" increases open rates), (3) free or freebie increases open rates in some industries (restaurant, recruitment, beauty, entertainment, music and art) but decreases them in others such as medical, retail, and travel. Instead of printing costly brochures and marketing collateral, your Web site is the critical piece of your zero-budget marketing strategy. Yes, it can be costly to hire some Web developers, or you can acquire free templates and build your own or have one of your employees or a low-cost contract employee to build it out for you. You will have to give them good direction on the marketing content using the tools discussed above. Here are some pointers to boost the effectiveness of your Web site. Design Metaphor. Do you want you site to be an online store, office, brochure, game, or something else? Home Page. You should put your brand signature (company name, logo and slogan) in the upper left hand corner. To the right of that you should create a headline that makes it clear why site visitors should do business with you. Your site should never require scrolling horizontally and while vertical scrolling is OK, it is better if they do not have to scroll beyond one screen on your home page. Golden Triangle. Make sure that "what is most important" is in the Google Golden Triangle area because this is where most eyes look when on a Web site, or search results page. Some say this is no longer valid, but clients have considerable success putting what's most important in this area. SEO. You want your Web site to be key-word rich since this is what the Web crawlers use to index and rank sites. Your key words should conform to your branding, the benefits of your product, your uniqueness, and the ways your customers tell you what they look for when they are searching for products such as yours. There are so many proven Search Engine Optimization techniques. It would be worth your time to familiarize yourself with them. As discussed above, just about everyone is talking about using social media in marketing products. The problem is too many don't know how to effectively do it. While "earned media" techniques such as hauling videos represent very exciting new ways for promoting products, most of them are experimental and outside the control of your business. In an effort to take advantage of social media without ceding too much control, marketers need to have some understanding of popular social media channels and how to integrate them with other Marketing strategies and implementations. Facebook has a large number of active users (over 1.55 billion at last count) and a lot of data on users so that advertisers can better target them. Since people go to Facebook to interact with friends and family, they do not like intrusions from companies. However, a lot of friends and family recommend products on Facebook, and company pages are very popular places for prospects to learn about products, discover new uses, find discounts, and share all this with their friends. At the very least, Facebook can make more brand impressions than other media. Companies pay $5 million for only 30 seconds of commercial time to reach roughly 110 million Super Bowl viewers one day a year. On Facebook, they have potential to reach a much larger audience at a much lower cost every day of the week. While Facebook limits ad sizes to very small spaces so as not to ruin user experiences, good marketers can make effective use of the space allotted with concise headlines. Twitter is great for those that know how to write good headlines since it limits users to 140 characters. While it accounts for much less Web traffic than Facebook and other social media, Twitter users tend to be more influential. Also, Twitter can easily be linked to other SM sites, such as Facebook, so that if you post on Twitter, your Tweet can automatically appear on Facebook simultaneously. Twitter has proven to be very effective in responding to complaints, rumors, and factual mistakes for damage control and to provide better customer service. Companies that have learned to use Twitter in this way have been able to "turn negatives into positives" and build closer relationships with their constituents. YouTube provides a place for companies large and small to reach their target audience without paying the high "real estate" costs of commercial TV channels. Furthermore, YouTube videos can be shared, and if they go viral, the numbers of viewers that actually watch the commercial can rival and even surpass TV audiences. YouTube viewers can also play the videos over and over again as well as share them with even larger networks of viewers enabling advertisers to make more brand impressions and greater sales. Linked In is good for business markets. The HR departments of businesses use it to find candidates, and businesses can put profiles of their products and white papers on the site, and use it to promote their business. According to Linked In, 43% of marketers have found a customer on Linked In during 2014. To increase the marketing power of social media, marketers should be sure to integrate it with all other direct and non-direct channels. A lot of companies ask market targets to visit their Web site and "like" or "follow" them on social media, but too often they do not provide the benefit for doing so. Similarly, social media rarely ties campaigns to off-line and other direct marketing efforts -- missing opportunities for marketing synergy, making additional brand impressions, and increasing sales. Companies with effective campaigns have linked product packaging and off-line media to social and online media. In addition to asking people to "like" or "follow" or visit social media and Web sites, they have given people codes in traditional media and on product packaging that give those that make the effort a chance to win something or save money. The feedback and contact information provided is more than worth the costs of the prize, rebate, or discount, and gives the company a chance to improve the product or add contact information to their database. There are numerous proven free or low-cost techniques you can use to do marketing on a small investment. To prevent this post from getting way to long (I might be there all ready, I will outline some of them below. Empty spaces.™ All physical locations (such as lobbies, hallways, waiting and conference rooms) and Web sites have empty spaces that could promote your awards, testimonials, and proven benefits. Use them. Sales Army.™ Customers and prospects and those with whom you interface in your normal course of doing business can refer business even if they do not become customers themselves. Enlist them in your Sales Army, and make sure they clearly know what you do and how you can benefit others like them. Newsletters, Blogs, and other content. There are so many vehicles online and off that you can use to communicate the benefits of your company and products. Use them, and communicate with your customer and prospect base at least 6 times per year. Publicity. Publicity works because others are saying good things about your company and products. This tends to be more credible than you communicating about yourself. Regular online press releases with photos can help the media to fill the spaces they are trying to fill in their publications. Elephant's trunk.™ The elephant's trunk strategy, if executed properly, neutralizes your competitors and focuses on your uniqueness. In your marketing online and off, you can say, "Our products give you what our competitors do plus we give you this..." The "this" is your unique benefits. Moving Buying Window.™ Many sales opportunities are lost because the sales people do not work leads and contact buyers when they are ready to buy. Good sales people understand the concept of the Moving Buying Window, where the buying window can open and close and move in time. If you contact your prospects at regular intervals, you are more likely to reach them when their buying window is open and active. If you don't, your competitors will. Negatives into positives. Negative situations are opportunities to build a closer relationship with prospects and customers. When something negative happens between a prospect and your company, handling it properly can create a loyal customer for life whereas handling it improperly can create an enemy that will tell others and damage your business. You need to neutralize the negative and turn it into a positive. Yes, you night have to re-do something or give them a discount, which might cost you something, but is far less-costly than the lost business that is likely to result. There are so many other low-cost or zero-budget strategies you can use to boost your business. The more of them you think about and employ, the more your sales and profits will increase. You don't need to spend a lot to do effective marketing. If you are a small business, non-profit, social enterprise, or the department of a large organization, you are likely to have a limited marketing budget. To be successful, you have to do effective marketing. Your marketing, however, does not have to cost you a lot of money. Hopefully some of the techniques delineated above will help you. Good luck.